More than 1,500 jobs could be created in the energy sector through increased long-term co-operation between the UK and Norway, David Cameron has said. The prime minister will announce an "energy partnership" with his Norwegian counterpart on Thursday, covering oil, gas and renewable production. Speaking in Oslo, he said he hoped fresh investment could help bring energy bills down in future. 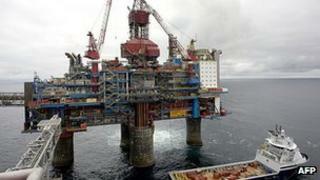 Norway already supplies more than 25% of the UK's annual energy demand. The Scandinavian country is seen as a "trusted and reliable" energy partner for the UK at a time when falling North Sea oil and gas output and uncertainty over the prospects for future nuclear and renewable generation have put the UK's long-term energy needs under scrutiny. Some experts have warned of an "energy gap" unless action is taken to find new supplies and improve storage capacity. Ministers have said the UK will become increasingly dependent on imported energy in the future, and the government is keen to strengthen existing links with major exporters such as Norway in the face of market volatility and geopolitical risks elsewhere. Norway accounts for about 65% of the UK's oil imports and nearly 60% of gas imports through three large pipelines. Thursday's agreement - to be signed by Mr Cameron and Norway's Prime Minister Jens Stoltenberg - is expected to focus on encouraging safe oil and gas exploration, securing long-term gas supplies and leveraging increased private investment in renewable technologies and energy grids. Norwegian and British firms are already collaborating on plans for the world's largest offshore wind project off the coast of England. The two countries also want to build a 560-mile (900km) interconnector - a giant undersea pipe - to transport surplus gas from Norway to the UK. The two governments want to make it easier for firms to raise money for such projects and to develop new technologies - which they argue could have huge benefits in terms of energy security and creating jobs both in exploration and in the supply chain. Speaking ahead of the announcement, Mr Cameron said the UK needed to do its utmost to meet its growing energy demands in an "affordable way". "I hope that my visit to Oslo will help secure affordable energy supplies for decades to come and enhance investment between our two countries," he said. "This will mean more collaboration on affordable long-term gas supply, more reciprocal investment in oil, gas and renewable energies and more commercial deals creating thousands of new jobs and adding billions to our economies." Norway exports nearly six times as much energy as it uses itself. Although it is one of the world's top oil and gas producers, it obtains most of its own energy through hydroelectric power. Mr Cameron's visit to Norway is the first by a British prime minister since Margaret Thatcher in 1986.